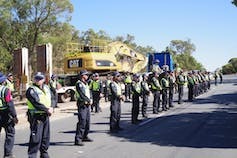 Clearing machinery arrives on site under heavy police protection, January 2017. The environment first emerged as a voting platform in the 1970s, in the wake of controversial proposals to dam Lake Pedder. The United Tasmania Group – a precursor to the Australian Greens party – was formed to oppose the project. According to Hugh Morgan – former president of the Minerals Council, the Business Council, and the climate-denying Lavoisier Group – the first indication that environmentalism had arrived as a major political force in Australia was the Whitlam Labor Party caucus’s 1975 debate over uranium mining and nuclear power. The Greens have also promised to retain A$370 in existing funding for water-quality projects, which it says brings its total financial plan for the reef to more than A$2 billion. This article was co-written by David Rickards, Managing Director of Social Enterprise Finance Australia. In what has been shaping up as the election that forgot climate change, there are signs emerging in the Coalition’s election campaign that it is starting to listen to polls, its own focus groups and social media chat on climate. So far it is the Great Barrier Reef that has drawn out the biggest campaign fight on climate. Prime Minister Malcolm Turnbull announced that A$1 billion of the Clean Energy Finance Corporation (CEFC) fund would be directed towards a Reef Fund. 10% of the money from the CEFC will be quarantined to make loans available to farmers in North Queensland. While Turnbull declared the greatest threat to the reef was global warming, he nevertheless specified that the run-off from farming into the reef was what would be tackled. This is seen to be a measure that could prolong the reef in a region where the Coalition is at risk of losing some marginal seats. So, one pitch is that saving the reef is about retaining 70,000 jobs that it sustains. But a less believable pitch is that the fund will battle climate change, with Turnbull saying that solar panels for farms in the region will reduce reliance on diesel, and that farmers would have loans for more energy-efficient farm equipment. Labor’s shadow environment minister, Mark Butler, derided the Reef Fund as a “shameless exercise in spin” insofar as such loans have already been available to farmers for years. … further cook the reef. A Labor government isn’t going to ban coal mining in this country … Coal is going to be part of our energy mix for the foreseeable future. … when we talk about the reef and when we talk about climate change, they are inextricably linked. … good environments generate good jobs. 70,000 people make a living from the reef. It generates $6 billion in turnover for the Australian economy. In another climate change publicity opportunity, in the wash-up of the east coast storm last week, Shorten and Turnbull spent a day surveying the flood damage in Tasmania – but only Turnbull ventured so far as to link the floods to climate change. In terms of climate and weather, today for me is not a day where I will join the dots about extreme weather events. Certainly, larger and more frequent storms are one of the consequences that the climate models and climate scientists predict from global warming but you cannot attribute any particular storm to global warming, so let’s be quite clear about that. Turnbull is incorrect about subtropical lows becoming more frequent, but he is right about climate scientists’ forecasts that storms will get bigger. If national policies in Australia and around the world are not calibrated to the 2℃ guardrail, the energy we saw released by last week’s storms will pale compared to what might be in store for future generations. Referring to the Eemian period of 120,000 years ago, which was the last time the global average temperature was as high as the threshold that the Paris agreement is trying to avoid, scientists are uncovering evidence of storms that were of an order not compatible with the built environments of today’s human settlements. In recent research, James Hansen, the author of the book Storms Of My Grandchildren, points to the puzzle of giant rocks in the Bahamas, up to one thousand tonnes, that are in a place they just shouldn’t be. Scientists warn these geological freaks harbour a terrifying secret – epic superstorms capable of tossing around boulders like bored Olympians. But so as to reassure voters, both leaders did talk up the importance of mitigating damage (through the likes of building levies) – but not mitigating climate change itself. While it was remarkable for Turnbull to discuss climate change at all in this election campaign, he failed to join the dots between the adequacy of the Coalition’s emissions reduction targets for Australia realising a responsible contribution to avoiding a 2℃ threshold. A likely explanation as to why Turnbull in particular is reasserting climate change and the reef as an issue – but not asserting any kind of policy that will fix it – may be his reverence for the power of social media, and what it is telling his media team about neglecting climate change. An analysis of 150,000 conversations on social media in Australia for the first three weeks of the election campaign reveals climate change is among the top five political topics Australians are talking about on Facebook, Twitter, YouTube and blogs. More than half of the discourse is negative towards each leader, with only 22% positive about Turnbull and 35% positive on Shorten. But of these posts, grouped around leaders, the only issue (other than negative gearing) that is common to discussion of both leaders is climate change. Climate change also stands out as the only issue in the top five that was not being aired by the leaders. The analysis, by Meltwater, is significant in that it is so different from a poll. Those who answer a poll know that it will be aggregated and is likely to have a political impact. Their answers may not actually reflect their concerns as much as it does the desire to have an impact. Analysis of social media, however, is more likely to capture the “backstage” of what people are actually concerned about in their daily conversations. Could it be that, buried in these backstage conversations, are clues as to why voters are turning away from the major parties? And that neglect of climate change is a big part of this? Could it also be why the major parties have made panicked preference decisions to block the Greens and independents, who combined may capture 25% of the national vote? There is evidence also that the Coalition’s announcements on the Great Barrier Reef are calculated to neutralise social media concern about it as an issue. Perhaps it is its focus groups or it could be simply the impact of talk show mega-star Ellen DeGeneres’ “Remember the Reef” video-message campaign. The campaign, which is also part of a promotion for a new film, Finding Dory, has seen Disney, the Great Barrier Reef Foundation and the Great Barrier Reef Marine Park Authority collaborate on raising awareness about the threats to the reef. 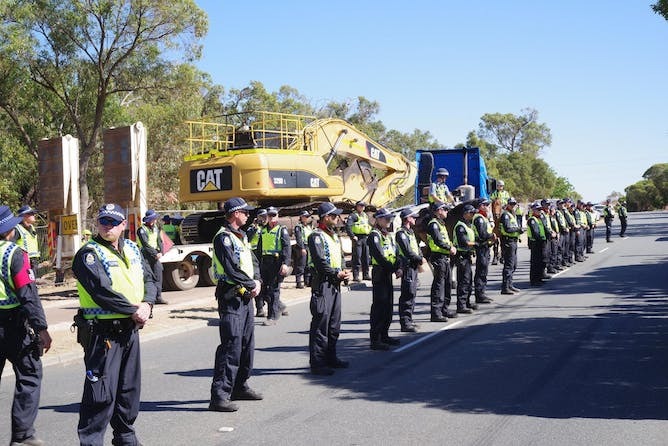 But more remarkable than this campaign was the barrage of tweets from Environment Minister Greg Hunt, strenuously defending the government’s management of the reef. A further tweet personally invited DeGeneres out to visit the reef to allay her fears. But the fear is mostly coming from Hunt it seems, that the Disney campaign really could get out of control, based on an animated movie that is to be screened just two weeks out from election day.